Incredibly detailed drawings on styrofoam cup. JustDaveyB presents all 85 pens in his collection. You need to look at this gorgeous photograph. The June 2013 Carnival of Pen, Pencil, and Paper will be hosted by Ed Jelley - check out his post and follow his link to submit your articles for the carnival! Speaking of Ed Jelley, check out his review of the TWSBI Vac 700 fountain pen. The Well-Appointed Desk shares a tutorial on how to replace a pen sac. Perfect. I need to get cracking on doing these. The beauty of pollination - a stunning video that, as my dad puts it, "will make you feel inadequate about your photography skills"! Does This Pen Write? reviews Branch Pencils! This week's adorable cat is, once again, brought to you by Mr. Guilt. 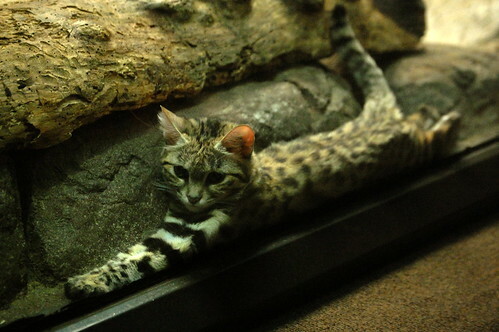 This is a ridiculously tiny and feisty little Black Footed Cat. One-time donations can be made through PayPal. Alternately, you can become a Patron and pledge your support regularly. All donations will go towards this blog! Thank you for your support! GourmetPens by Azizah Asgarali is licensed under a Creative Commons Attribution-NonCommercial-NoDerivs 3.0 Unported License. Based on a work at http://www.gourmetpens.com. A Big Toronto Pen Company Announcement! Unboxing Franklin-Christoph Model 46 Autumn Oak Fountain Pen with Music Nib!